In this episode of the HomeschoolCPA podcast, Carol Topp will share some of the reasons that some groups are exclusive (they do not allow public school students into their homeschool group) but it comes from a few people who are active in legislation or in their state homeschool groups. They have a different viewpoint that you may find insightful and interesting. The lines of what is homeschooling are blurring and state legislators may not understand the difference between traditional or independent homeschooling and public-school-at-home. You can learn a lot about running your homeschool group from the HomeschoolCPA podcast and website (and books) , but sometimes you just need to TALK to someone who understands homeschooling, running a group and the laws surrounding the finainces and operations of homeschool groups. 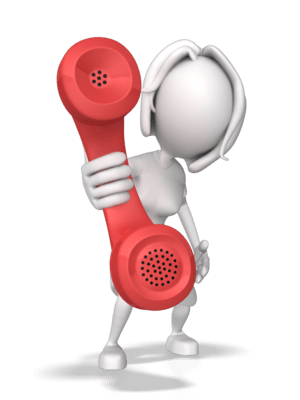 Why not call Carol Topp, the Homeschool CPA, to set up a personal call? Carol is happy to set up a conference call so several of your leaders can join in from their own homes. The call can be recorded or future reference or for those who are unavailable. This is Carol’s most popular service for homeschool leaders. It’s like having your own homeschool expert CPA on the phone! Your homeschool support group is probably a social club in the eyes of the IRS. Listen to this short podcast as Carol Topp, the HomeschoolCPA explains that social clubs can get automatic tax exempt status without applying, but they must maintain that tax-free status. Lots of homeschool support groups find themselves evolving into bigger organizations than their founders imagined. They grew from being small monthly support groups to larger organizations offering field trips, co-op classes, graduation ceremonies, clubs, and other activities. For example, TACHE (Tyler Area Home Educators) in Tyler, Texas began in the 1980s as a small support group for homeschool families. They grew to over 400 families and now manage an annual budget of nearly $20,000 and offer a plethora of educational activities. They wisely decided to incorporate as a nonprofit corporation in 2009. But, unfortunately, TACHE did not apply for 501(c)(3) tax exempt status at that time. In September 2013 TACHE decided it was time to apply for tax exempt status as a 501(c)(3) educational organization and contacted me. Because TACHE waited more than 27 months after their date of formation (in 2009) to apply for 501(c)(3) status, we had to explain TACHE’s history to IRS and give an explanation why they did not apply earlier. I helped TACHE apply for 501(c)(3) status in February 2014 and after about 7 months of waiting, the IRS granted 501(c)(3) status. But TACHE wasn’t finished with the IRS just yet. TACHE failed to file their Form 990-N Annual Information Return with the IRS for three consecutive years and had their tax exempt status automatically revoked. We were concerned that there would be a period of time when TACHE would have to file and pay income tax. There were a few phone calls and letters to the IRS, but finally the IRS reinstated TACHE’s tax exempt status and agreed that they did not owe any back taxes. The process is does not always take that long, but here are a few lessons learned. File the Form 990-N every year. This is required for support groups as well as homeschool co-ops. If you fail to file the Form 990-N, the IRS will automatically revoke your tax exempt status. Get help when you need it. My fees are reasonable and I focus on helping homeschool organizations. Contact me. Be patient. Although the IRS has cleared a lot of their backlog, it still took 11 months for the IRS to reinstate TACHE’s tax exempt status. Learn all you can about tax exempt status for your homeschool group. My book, The IRS and Your Homeschool Organization, is a good start. Congratulations to TACHE! It was along process, but it’s finished and TACHE can continue to serve homeschool families in Texas for many years to come. I will be recuperating from surgery and will be unavailable to answer your emails from November 15, 2015 until January 2016. Until then, here’s how you can get help. The world of homeschooling is changing and it’s getting harder to define our groups. Support groups morph into co-ops. Co-ops add many support activities. Some co-ops grown into school-like programs. The Arizona Home Education website has a definition of each type of homeschool group. What do you think of their definitions? Here’s my attempt to define each type of homeschool group. It’s incomplete and will probably change over time as creative homeschoolers start new types of groups to meet the needs of future homeschooling families..
Support Group: a gathering of homeschool parents or those interested in homeschooling for information and support. Typically hold monthly meetings for parents and may organize field trips or social events for children and families. Homeschool Co-op: A gathering of homeschool parents and students who cooperate together in sharing teaching responsibilities for their homeschooled students. Usually meets once a week and frequently all-volunteer. Homeschool Educational Program: Academic and enrichment classes for homeschooled students. May hire qualified teachers to conduct the program. Usually more expensive than an all volunteer co-op. Homeschool Sport/Music/Art Program: Similar to a homeschool program , but focuses on sports, music, or art. Homeschool Club (Lego, Speech/Debate, Yearbook, etc): A club focusing on a specific topic for homeschooled students. Frequently organized under a homeschool support group, but clubs can be stand-alone as well. Homeschool Business: a for-profit business offering services to homeschooling families. Can be tutors, book sellers, and even my, business HomeschoolCPA offering accounting and tax advice to homeschool organizations. How did I do? Leave your comments here or on my Facebook page. What? 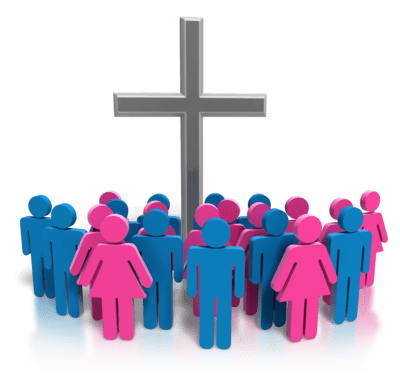 Homeschool support groups cannot be religious?! Our homeschool support group has a statement of beliefs that every member must sign to be a member. However, I was reading the 501c7 guidelines for Social Clubs and learned that we cannot discriminate based on religion. Does that mean in order to be tax exempt we cannot require a belief statement? Lana is referring to this IRS statement on Social Clubs. 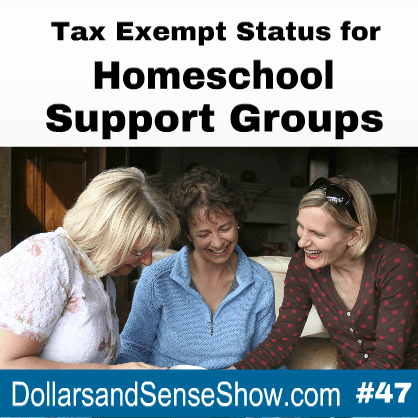 Most homeschool support groups fit the criteria to be tax exempt as a 501(c)(7) Social Club. Like many laws, you need to keep reading to see if there are exceptions to the general rule. But Lana’s group does have a written policy, a Statement of Faith, that every member needs to sign. Does that mean homeschool support groups cannot have a Statement of Faith? IRC § 501(i)(2) provides an exception for a club which in good faith limits its membership to the members of a particular religion in order to further the teachings or principles of that religion, and not to exclude individuals of a particular race or color. So, Lana’s homeschool support group can have a statement of faith and discriminate on the basis of religion provided their purpose is to further the teachings and principles of their religion (and they don’t discriminate on the basis of race or color). 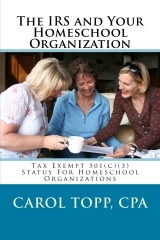 Carol Topp, the Homeschool CPA, explains tax exempt status for homeschool support groups in her latest podcast episode. In religious discrimination allowed or not? Carol also discusses the advantages of forming as a nonprofit corporation. 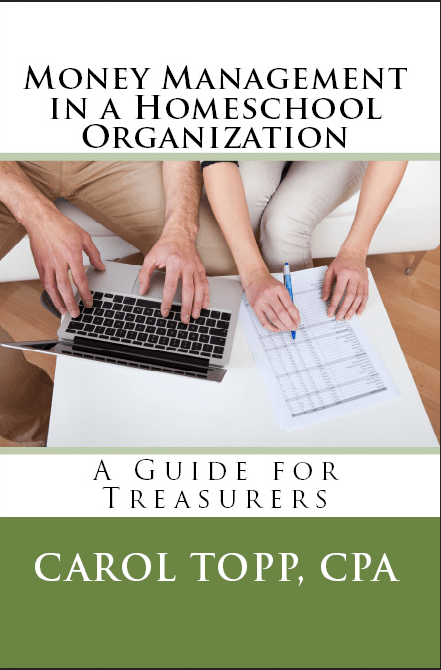 Carol’s book, The IRS and Your Homeschool Organization, discusses the advantages of tax exempt status for homeschool organizations. Carol also mentioned her book, Money Management in a Homeschool Organization. Episode #6 What is tax exemption and how do I get it for my homeschool organization? 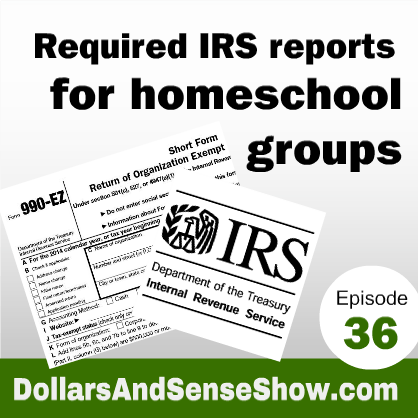 Episode #37 Has your homeschool group lost its tax exempt status? Episode #41 Who’s afraid of the big, bad IRS? Episode #42 How the IRS sees homeschool co-ops. We’re a newly organized homeschool support group. Is there anything we need to do with the IRS to establish ourselves as a 501c7 social club, or do we just need to get our EIN and start filing the 990N? After you get your EIN (Employer Identification Number), you won’t be able to file the 990-Ns just yet. Since you have not applied on paper for 501(c)(7) status (you can “self declare” 501c7 status and don’t have to file the paperwork), you are not in the IRS database (yet), so you need to call the IRS Customer Account Services at 1-877-829-5500 and be added to their database so you can begin filing the Form 990Ns. It typically takes 6 weeks after you call to be added to the IRS database. **Note that only 501c3 organizations with less than $5,000 annual gross revenues can “self-declare” their tax exempt status. 501c3s with more than $5,000/year in revenues must apply for 501c3 status using Form 1023 or the new, shorter Form 1023-EZ. They will ask for your EIN and organization’s name, address, and probably a contact name. They may also ask what date your fiscal year ends. Many support groups operate on a calendar year, but some operate on a school year with a year end of June 30 or July 31. Look at the form you filed when you applied for your EIN to see what you chose as your fiscal year end. They may ask if you have “organizing documents.” They mean bylaws or Articles of Association (or Articles of Incorporation). So tell them if you have bylaws or Articles of Association/Articles of Incorporation. Samples can be found here. Finally, if they tell you you must file a Form 1024 to obtain 501(c)(7) tax exempt status, tell them (with confidence) your CPA informed you that you can “self declare” tax exempt status as a social club and do not have to file the Form 1024. Call the IRS early in the morning. They open at 8 am ET and you can usually get through pretty quickly of you call then, Record the date you call, the IRS employee name and their identification number. Don’t forget to the the 990-N every year! Be sure you go online to file the Form 990-N anytime after your fiscal year ends and before its due date which is 4 1/2 months after the end of your fiscal year. So if you operate on a calendar year, the 990-N is due May 15. Way back in 2009, I was asked by Denise Hyde to review her book One By One: The Homeschool Group Leader’s Guide to Motivating Your Members. “One by One is a book that every homeschool leader needs, but does not realize the need until it is too late! 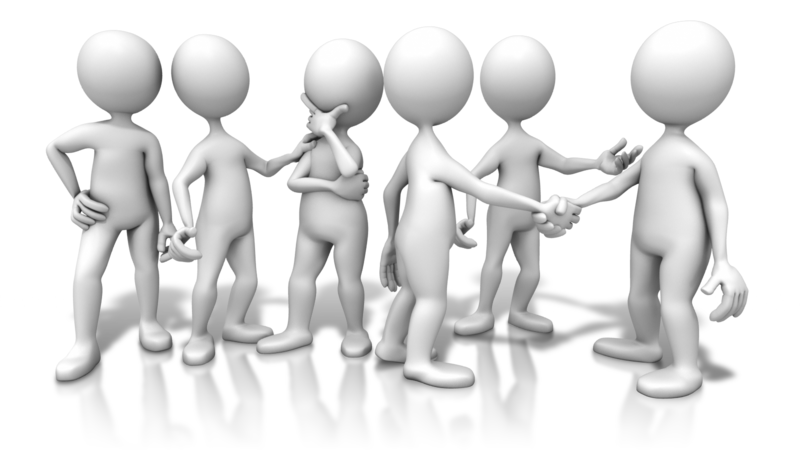 Every leader has difficulty motivating members or getting volunteers, but they only ask for help when it’s too late and they are tired, frustrated and want to quit! Instead, leaders should read Kristen and Denise’s very practical and encouraging book. Inside you will find the three secrets to successfully motivating every member and then practical, real-life ways to apply those skills to everyone from moms to teenagers. I especially appreciated the true stories of how Kristen and Denise implemented everything they suggest. Well, now I’m pleased to announce that Denise is updating the book and I will be helping her get out the word about this terrific resource. She’s going to set the price a bit (well, a lot) lower and offer it in print and in ebook format. There is a little more work to do on the book, but it should be ready in a few weeks. I’ll send out an email when it’s ready. And I’ll probably have Denise on my Dollars and Sense podcast to help you motivate every member!